Manipuri boxer Khumukcham Sanjita Chanu will be nominated for the prestigious Arjuna award this year by the Union Ministry of Youth Affairs and Sports. The decision came as a result of a year-long court battle between the weightlifter and the ministry at Delhi High Court. Chanu had filed the case against the ministry in 2017 at the high court as her entry was overlooked for the title despite her gold medal performance at the Glasgow Commonwealth Games in 2014. An order, passed by Justice Vibhu Bakhru on August 30 this year, said as the ministry has assured that it would nominate Chanu’s name for the award, no further order would be passed on the matter. The high court has ruled that Chanu’s name be placed before the selection committee, counting her achievements from 2014 onwards. The committee, while counting her achievements, should include the gold medal she won at the 2018 Commonwealth Games in Gold Coast, Australia, as well. The Indian Weightlifting Federation had twice nominated Chanu’s name for the Arjuna award in 2016 and 2017. However, Delhi High Court said the recommendation of the selection committee should be subject to clearing the dope charges as she had been placed under provisional suspension since May 15, 2018, for failing a test conducted in Los Angeles, US, on November 18, 2017. The court further directed that the selection committee should consider the nomination of Chanu, uninfluenced by the alleged drug charge, which she has been accused of. The selection committee is of the view that Chanu is entitled to be nominated for the Arjuna award 2018, the decision shall be kept in sealed cover and her name should be disclosed when she is cleared of the doping charges, reports The Telegraph. The high court said the doping charges, which have been in study and probed at the moment, is likely to take a year or so to conclude. Chanu’s counsel, advocate Hemant Phalpher, has argued that his client had all the required qualifications to be considered of the award. 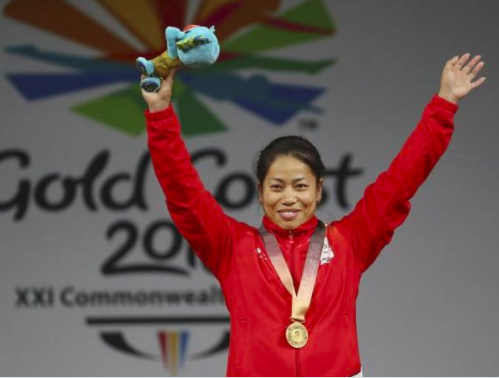 Chanu’s gold medal from the 2014 Commonwealth Games, is worth 30 points, while she won another 15 points from a senior women’s weightlifting championship, totalling 45 points.